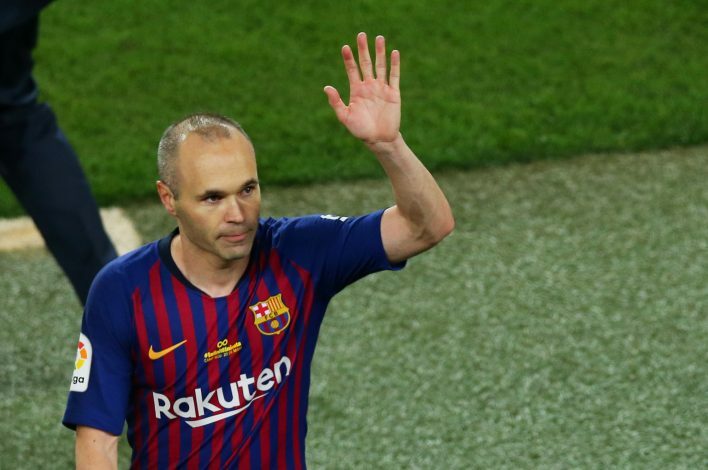 La Liga champions Barcelona bid farewell to legendary midfielder Andres Iniesta, as the Spaniard played his final game for the Catalan giants in their 1-0 win over Real Sociedad. The 34-year-old player saw his 22-year-old stint with the club finally come to an end at the Camp Nou. Barcelona fans formed a mosaic with the message ‘Forever Iniesta’ prior to the game in a packed stadium. The top class midfielder bowed out as a champion, as the club won the double this year that included La Liga and Copa del Rey titles. This was his 669th match for Barca, as he ended up with 57 goals in a career that saw him win a mammoth 32 trophies. Iniesta was also given another standing ovation as he left the pitch for the final time in the 81st minute. He hugged all his teammates and handed the captain’s armband to Lionel Messi, and walked off with a rousing applause as there were tears in his eyes. Barca celebrated their La Liga trophy celebration after the match with the lights being shut out. Iniesta was also given a guard of honour. One of the greatest players of his generation, Iniesta dominated the pitch all these years, and won hearts of everyone all around the world.